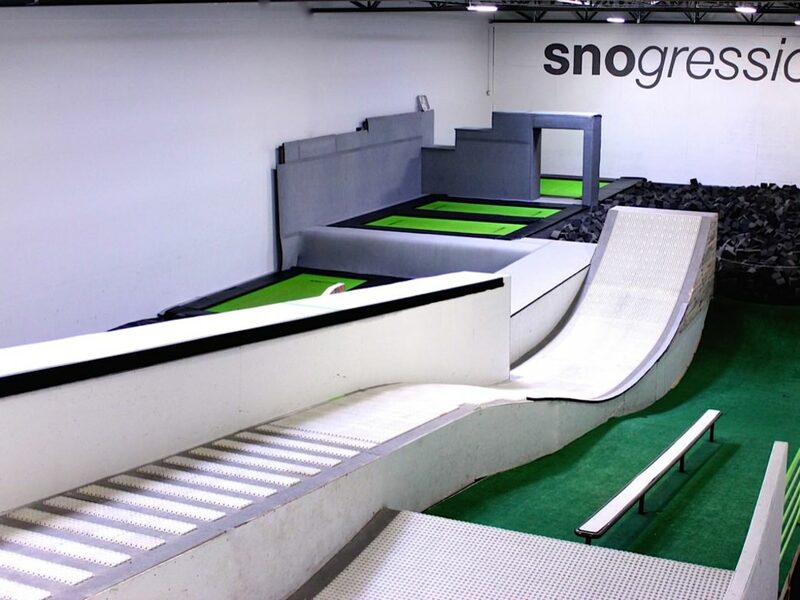 Walking into Snogression in Salt Lake City is like entering an oversized playground. 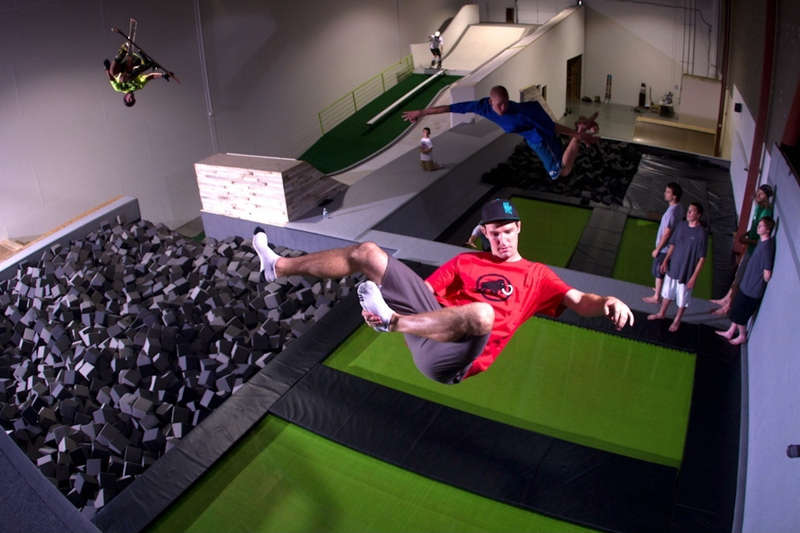 This elaborate, yet informal facility is a mishmash of Olympic-grade trampolines, foam pits, crash pads, and a large ramp that sends jumpers flying into an extra-large foam pit. Built in a warehouse in the industrial district west of Salt Lake’s I-15, the space feels feel gritty and raw, yet an impressive level of attention to detail ensures every element comes together with safety and functionality. Fortunately, Snogression offers on-staff coaches who help visitors up their game either in single sessions or over the course of weeks and months. A sit-down with one of these coaches, Peter Fitts, yielded a solid game plan for those aspiring to airtime and, dare we say, learn some awesome ski tricks. So, what’s your skiing/coaching background, and in your professional opinion, do you think grown-ups without a park and pipe resume have a chance? I’ve been a pro skier but also have extensive coaching experience, mainly in gymnastics—which obviously applies here. And yes, there’s hope for amateurs: A friend of mine just texted me to say he did his first back flip at Alta today—and he’s a thirtysomething adult who just started training here a few months ago with zero tricks up his sleeve at that point. So there’s room to grow for anyone who is already a proficient skier or boarder and just needs to build that air awareness. Explain this “air awareness” concept. It just means having a certain level of spatial awareness and control mid-air. It’s actually really critical to successfully learning tricks. Part of it is guts, part of it is practice, but a huge component is just having a level of comfort and control in the air. It comes from having a really strong core. People get very sore from training on our trampolines, and it’s because flying through the air engages muscle groups you never knew you had. But as you practice and build strength, the muscles in your abs, hips, back, and neck all develop to support you mid-air. Holding your core firmly while you fly is really key to looking good and sticking your landing—in fact, that’s why grabs [when a snowboarder or skier grabs the edge of his/her skis or board in mid-air] can help. They keep everything locked up tight. What’s the big idea behind an indoor training facility? How does it help? It makes a big difference in a few ways. For one thing, gymnastics gyms have big trampolines too, but since they’re not ski- or snowboard-specific, they have a lot of rules regarding what you’re allowed to try. And ski and snowboard training camps can be cost-prohibitive. Yes, you’ll learn a lot, but do you have a couple grand to drop? This offers an inexpensive way to train indoors, getting a coach’s input along the way, for far less money. You can afford to learn, play, mess around at your own pace. Also, an indoor setting like this is so safe that cautious people, which is most adults, feel comfortable dipping their toes in the water and pushing themselves a bit. It’s less committing than trying a big jump or new trick over hard-packed snow, which is what you’d have to do if you’re learning at the resort. What sort of progression would you recommend for someone new to this kind of trickery? We’d probably start you on the trampolines, having you jump and get comfortable high up in the air. There are tons of exercises you can do to build strength in your calves, quads, and core on the trampoline. Over time, we’d start introducing tricks. A backflip is, actually, what I usually recommend working on first. It’s really intimidating, but it’s actually a very intuitive and easy trick once you try it. As soon as you’re midway through, you can see your landing beneath you—and if you can spot your landing, you’re all set. Once you’ve mastered your backflip, we’d work on other tricks like a misty flip or cork seven. 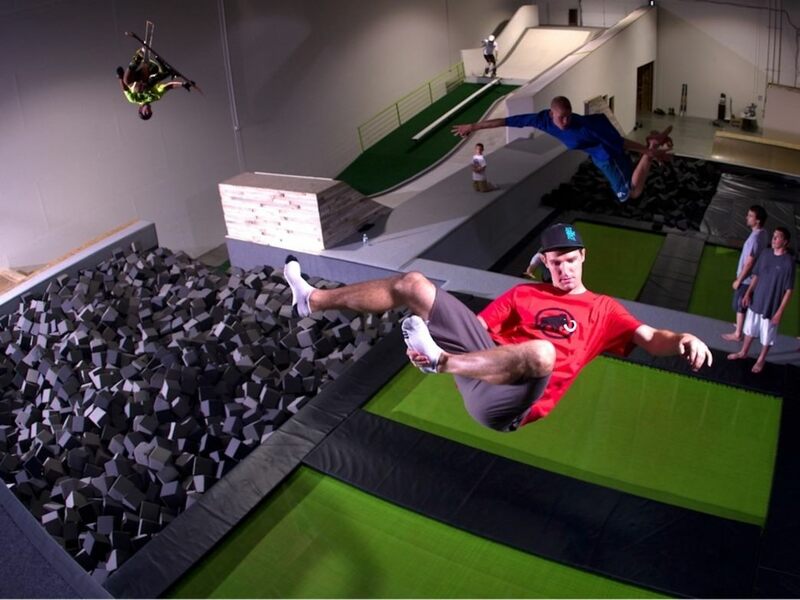 You initiate on the trampoline and land in a foam pit to the side. 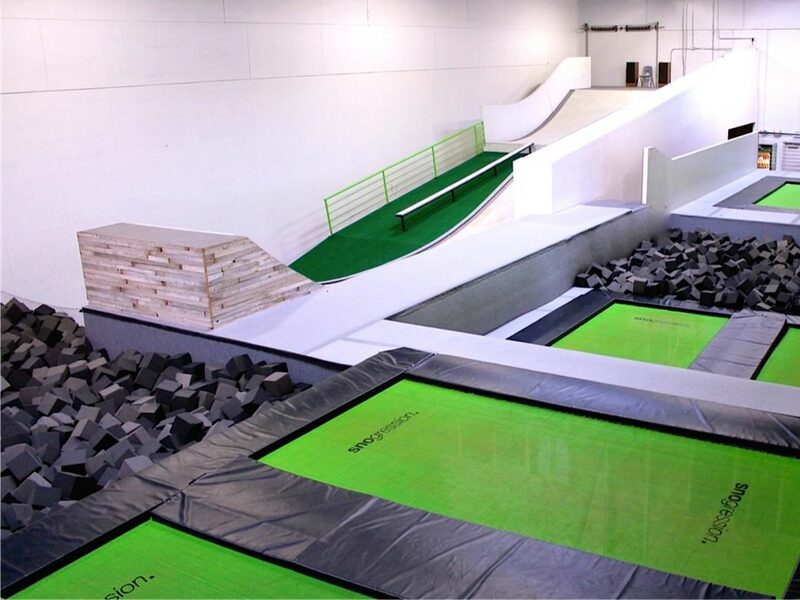 Eventually, as you feel ready, you can start trying those tricks going off the ramp into the bigger foam pit. The great thing is, once you’re comfortable doing a trick on the ramp, you’ll find it’s even easier outside. This ramp skis like a very icy run and outdoor snow conditions are usually better. Does the weight of your skis or snowboard throw you off once you start practicing on the ramp? It actually really helps. Something about having your boots and your ski or board on helps you keep your momentum in a spin or flip. Physics is in your favor. Is most of your clientele comprised of young fearless kids? Actually, you’d really be surprised. We have a lot of adults here, both locals and people who are just passing through. There’s a difference in caution level between adults and younger kids. Adults are more apprehensive, usually—jumping and spinning doesn’t feel as automatic. But it’s something we coach people through. They can be safe and push themselves at the same time. So there you have it, folks—from a bonafide professional: There’s hope for skiers who weren’t on the freeride teams growing up and didn’t go to the fancy training camps. See you on the tramp, fellow airtime dreamers.